While interacting with the media Narayan Gowda President KRV said, "The Government of Karnataka provides lots of incentives to the industries established in Karnataka with an intent to create more jobs to Kannadigas." 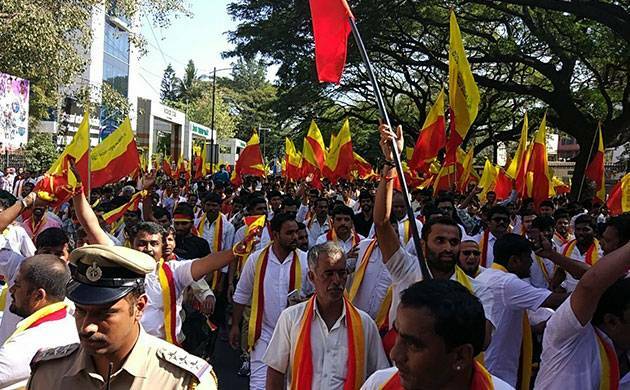 In the poll-bound state of Karnataka, thousands of members and supporters of Karnataka Rakshana Vedike, a Kannada outfit, popularly known as KRV, took out a protest rally in Bengaluru on Saturday from National College ground to Freedom Park demanding compulsory job reservation for Kannadigas in the state. While interacting with the media Narayan Gowda President KRV said, "The Government of Karnataka provides lots of incentives to the industries established in Karnataka with an intent to create more jobs to Kannadigas. However, in the current scenario, it is not the case. People of Karnataka have been deprived of job opportunities in both government and private sectors". 1. Hundred percent job reservation for Kannadigas in state government departments and state-owned industries. 2. Candidates who have learnt Kannada as a language till SSLC in school should be considered for all the jobs in central government offices and industries operating in Karnataka. 3. Candidates who have learnt Kannada as a language till SSLC in school should be considered for all the jobs in private sectors in Karnataka. 4. Provision should be made to take an exam in Kannada in all the competitive examinations held by state and central governments. Also, allow candidates to attend interviews in Kannada. 5. All the contractual or daily basis jobs in central and state government departments and industries should be provided to Kannadigas. The same rule should be applied to outsourcing companies as well. 6. Candidates who have learnt Kannada as a language till SSLC in school should be considered for all the jobs in central, private and rural banks. 7. In order to consider a person as local, the person should have stayed in the state for 20 years and knowledge of local language is mandatory and should have studied Kannada as one of the languages till 10th standard. 8. Candidates who have studied till SSLC in Kannada medium or have studied Kannada as a language outside Karnataka should be considered as locals. Karnataka is going to elections in 2018 and Kannada language and job reservation for Kannadigas will be two most important election issues. However, Chief Minister Siddharamaiah has already started showing himself as a pro-Kannada leader after his government removed Hindi signboards from metro train stations in the city.